Pretzel Logic's Market Charts and Analysis: How Many Fed Chairmen Does It Take to Replace a Light Bulb? How Many Fed Chairmen Does It Take to Replace a Light Bulb? Q: How many Fed Chairmen does it take to replace a burnt-out light bulb? A: None. The Federal Reserve is not currently forecasting any darkness, and feels the fundamentals support continued illumination. Last update expected lower prices, and the market has since delivered. Looking at the charts now, I still find it difficult to locate a pattern which suggests a meaningful bottom has occurred. There's one potential pattern that's intermediate bullish, but the short-term charts suggest even that pattern would still require a new low. 1. The decline from 1696 is clearly three waves right now. That leaves open the potential of an expanded flat (shown in blue). 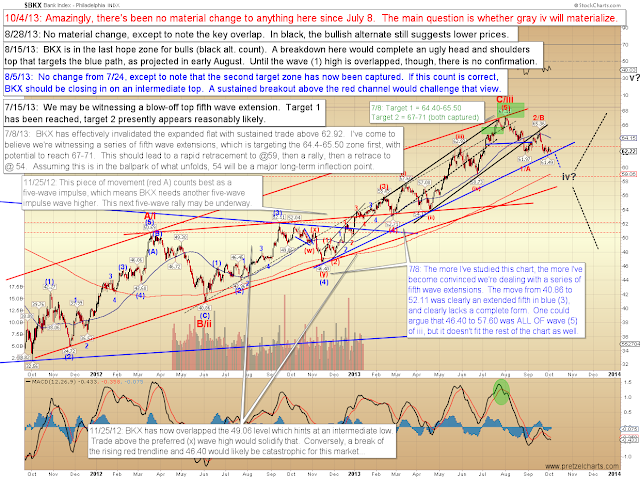 The market will need to break out over the black and red trend lines to give that pattern legs, and the possible targets in that event are noted. 2. The mega-bear potential is that the market is winding up for a big, sustained decline (a bearish nest of first and second waves). That option is shown in black. 3. There's really only one bullish potential I can find, which also results from the three-wave decline: an ending diagonal c-wave which tests the blue trend line. 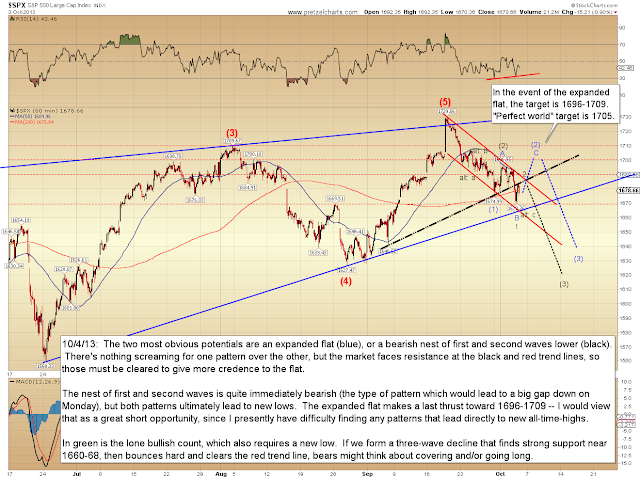 Bears don't want to see another three-wave decline here, or that pattern gains traction. Below 1657, and we can probably forget the bullish alternate for the time being. Given the complexity of the options, I've tried to simplify this chart as much as possible -- and the main simple point to convey is: I find it hard to locate a pattern that doesn't still require new lows. The Philadelphia Bank Index (BKX) also still appears to want new lows. 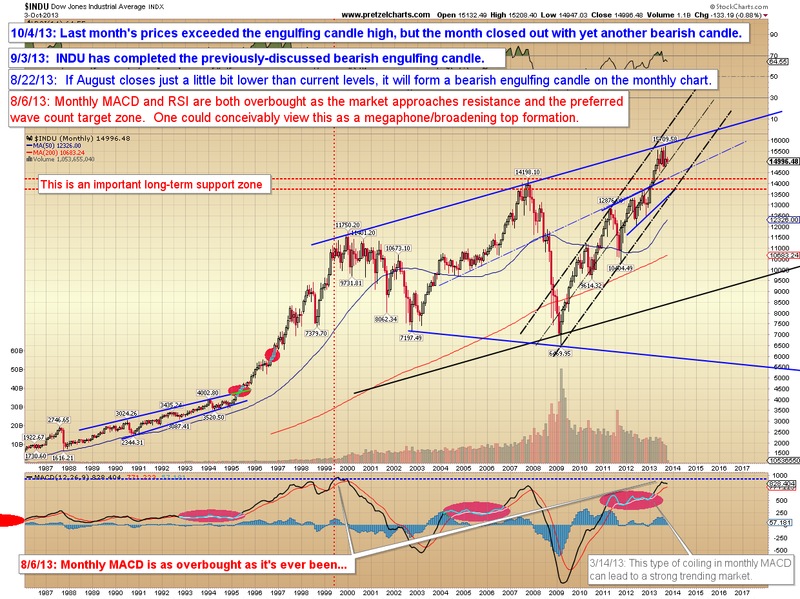 This chart is virtually unchanged since early July. The Dow Jones Industrial Average (INDU) has been a real dog lately, and the decline off the all-time-high has been relentless. 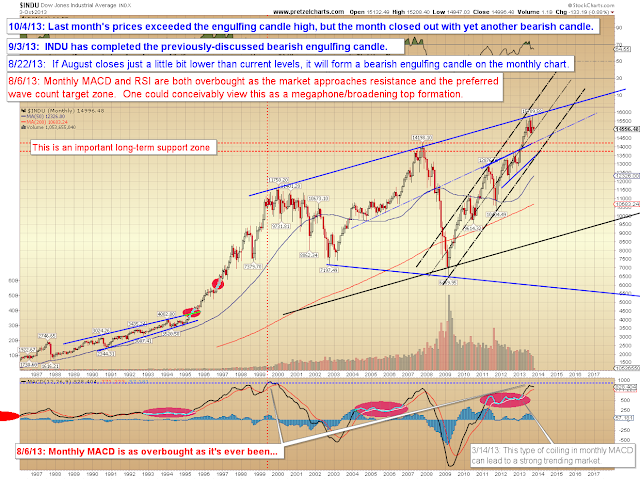 We've previously discussed the massive potential broadening top/megaphone pattern. While INDU managed to clear August's engulfing candlestick last month, it's interesting to note that INDU has formed another bearish-looking monthly candlestick for September. The long wick shows INDU's advance to the all-time-high was met with strong selling pressure... again. 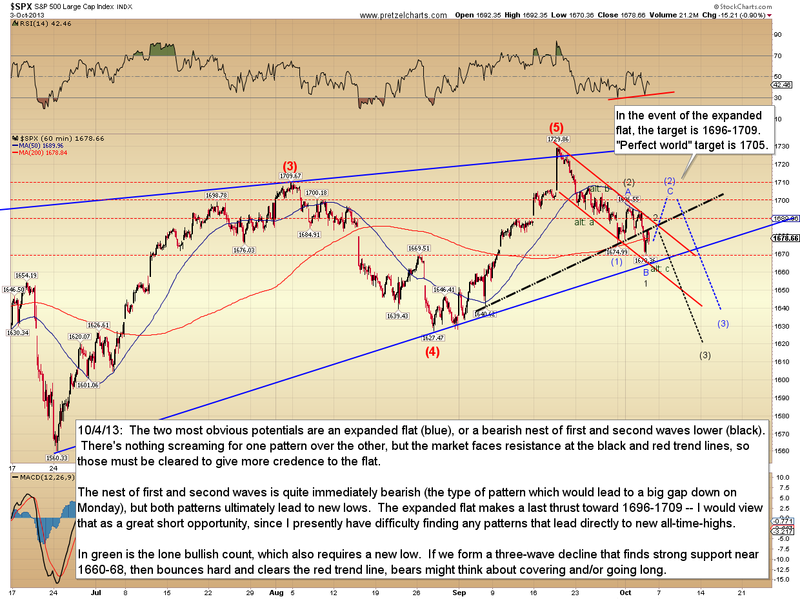 In conclusion, I don't see much that suggests the market can escape another new low. If bulls can form another three-wave decline here and stick save SPX at the major trend line, they could finally put a stop to the decline. If they can't, then what we've seen so far has only been the warm-up, and the market is going to run into some serious selling pressure very soon. Trade safe.